Divorce parties—which recently have been discussed in The New York Times and CNN—are an emergent part of contemporary society. 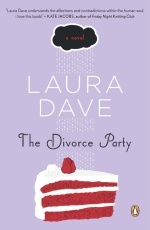 Laura Dave’s highly anticipated The Divorce Party (Penguin; April 28, 2009; $14; 9780143115601) is the first novel to focus on this growing phenomenon. The Divorce Party brings together two immensely appealing women, one who is stumbling upon the end of her marriage, and one who is just beginning hers, both asking themselves: how much work is it worth to keep two people together. This is a multigenerational love story full of humor, candor, and a powerful message about how to commit to someone over the course of a lifetime. The movie rights to THE DIVORCE PARTY have already been scooped up by Universal Studios for Jennifer Aniston and her production partner, and is set for release in 2010. Laura Dave is the author of the acclaimed novels The Divorce Party and London Is the Best City in America. Her writing has appeared in The New York Times, Glamour, Self,Redbook, ESPN the Magazine, and The New York Observer. Dave graduated from the University of Pennsylvania. In August, Cosmopolitan magazine named her as one of the eight "Fun and Fearless Phenoms" of 2008. She lives in California. One entry only - just say "I want this book"
I would like to read this book. Please enter me in the giveaway. I want to win this book. I'm excited about the book. Want to read it badly. I want this book!! I want this book, please. I want this book. Thank you.